Garmin India has introduced Forerunner 645 Music GPS running watch with the cutting edge feature of built-in music. True to its principles of innovation, convenience, performance, value and service, this product brings high quality and accuracy standards that Garmin stands for. The watch offers a light and pleasant running experience to the enthusiastic runners, with music integrated into the watch; athletes can enjoy the run with wonderful music suited to their taste and mood. The built-in GPS and GLONASS features allow the athletes to keep a track of their runs without having to carry a phone. With the launch of the Forerunner 645 Music, the stylish Forerunner line has got a sophisticated makeover. It’s a lightweight, swims friendly, fashionable watch in the metal bezel. The Garmin Chroma DisplayTM, under the strengthened glass, makes it easy to read the text even under sunlight. The watch comes in exquisite colours of black and cerise. Using interchangeable bands of different colours makes it easy to wear all day, every day, for all occasions. The watch has up to 7 days of battery life in smartwatch mode and up to 5 hours in GPS mode with music. 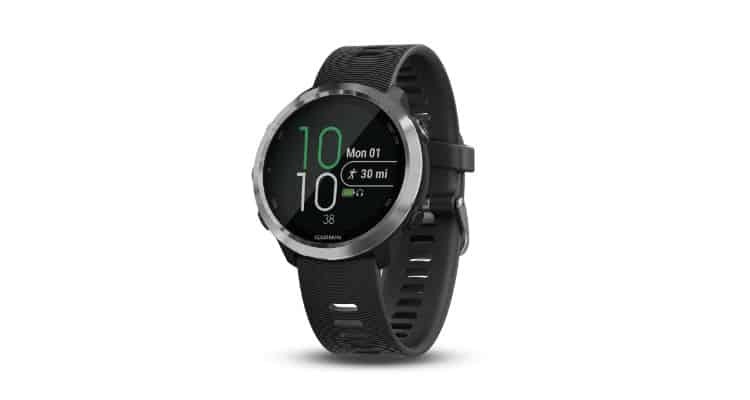 This device is equipped with a 24/7 heart rate monitoring system, advanced running dynamics, performance monitoring tools, connected features and many ways to customize using free watch faces, widgets, data fields and apps through the Garmin Connect IQ store. With a compatible smartphone, the users can stay connected with Garmin Connect, an online community, with updates on workouts, online challenges and virtual rewards. Users can thus receive and respond to text messages, invite friends to follow their runs in real time, exchange emails etc. Music gives the runners an extra spring in the step. It can make the workouts enjoyable and motivating. The Forerunner 645 Music has on-device music storage, up to 500 songs. It is compatible with music services and can be loaded directly from the computer. The device can be used with compatible Bluetooth headphones (sold separately). Playing music and selecting tracks, is easy while on the move. Users are fully equipped to relish the pleasure of their favourite songs during all activities from cycling to swimming to recreational activities. This comfortable and wearable device with non-stop music can keep users focused on their fitness goals. Music could be the inspiration to challenge the usual workout limits. Other features include wellness monitoring, that tracks for stress, relaxation based breathing timer to help balance stress and rest, furthermore, the custom workout that allows users to create customized exercise workouts. Additionally, the anaerobic training effect measure tells athletes how their hard work and training is improving their ability to push beyond their limits. Users can view their overall training load, which measures the exercise volume from the last seven days and compares it to the optimal range for their fitness and recent training history. The watch can be used with other Garmin products to enhance its utility. Garmin Introduces Forerunner 645 Music GPS Running Watch 0 out of 5 based on 0 ratings. 0 user reviews.